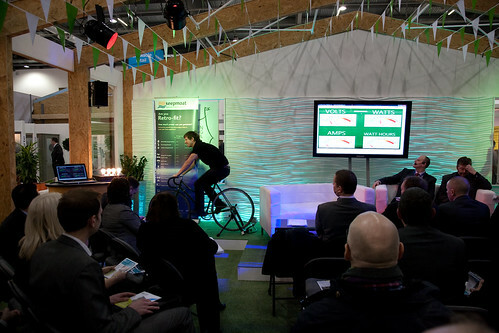 Pedal Powering the EcoBuild Conference! We showcased our youWatt energy challenge, an installation designed to get people thinking about just how much energy is required to power every-day appliances. Some of the delegates were very surprised to find that they were unable to generate 3000watts to power a kettle. Instead it was more like 200watts to power an electric blanket! It's a great way to get people thinking, particularly when the next switch on the kettle or turn on the electric shower! Another first was that we were 'the prize' for a Dragon's Den style session with three community groups competing for the opportunity to have the our What is a Watt? installation in their local area for one day. It was interesting to hear what they had planned for our gear. We enjoyed speaking to Sophie from the Sanctuary Group in Sheffield but despite her stirling efforts we were won by A Newcastle Housing Group.